We reported that Pla2g5-null mice lacking group V secretory phospholipase A2 (gV-sPLA2) showed reduced eosinophilic pulmonary inflammation and Th2 cytokine generation when challenged with an extract from house dust mite Dermatophagoides farinae, compared with wild-type (WT) controls. Adoptive transfer studies suggested that gV-sPLA2 in dendritic cells was necessary for sensitization of Pla2g5-null mice, but was not sufficient to induce the effector phase of pulmonary inflammation. In this study, we demonstrate that gV-sPLA2 is inducibly expressed in mouse and human macrophages (Mϕ) activated by IL-4 and is required for the acquisition of Mϕ effector functions that facilitate the effector phase of pulmonary inflammation. We demonstrate that gV-sPLA2 expression in Mϕ is sufficient for the development of pulmonary inflammation, even when inflammation is induced by intrapulmonary administration of IL-4. The concentrations of CCL22/CCL17 and effector T cell recruitment are severely impaired in Pla2g5-null mice. Intratracheal transfers of enriched CD68+ cells isolated from the lungs of D. farinae–challenged WT donor mice induce eosinophilia, chemokine production, and recruitment of T cells into the lungs of Pla2g5-null recipients previously sensitized by WT D. farinae–loaded dendritic cells. Our studies identified a unique function of gV-sPLA2 in activation of Mϕ and in their capacity to recruit T cells to amplify the effector phase of pulmonary inflammation. Phospholipases A2 (PLA2) are a family of enzymes that generate free fatty acids and lysophospholipids from membrane phospholipids (1). PLA2-liberated arachidonic acid provides the substrate for the synthesis of eicosanoids (PGs and leukotrienes), mediators of inflammation and allergic disorders (2, 3). Whereas the group IVA or cytosolic PLA2α is exclusively intracellular and absolutely required for the generation of arachidonic acid (4), the secretory (s)PLA2s likely serve both intracellular and/or extracellular functions (1, 5) some in a cell-specific fashion (6–8). Studies in humans suggest that sPLA2s can be inducibly expressed and activated during allergic pulmonary inflammation in asthma (9), mostly group V secretory phospholipase A2 (gV-sPLA2) (10), gIIA-, and gX-sPLA2s (10, 11). Mouse models of pulmonary inflammation induced by systemic sensitization and inhalation challenge with OVA suggest that gV-sPLA2 and gX-sPLA2 may be functionally important in allergic airway disease (12, 13). However, neither the cellular sources of the enzymes nor their distinguishing functions are known. Macrophages (Mϕ) are a heterogeneous cell lineage (14–17). Immune responses can direct macrophage development into classical activated (Ca) and alternative activated Mϕ (AAMϕ) (18) or M1 and M2 (19). CaMϕ are associated with Th1-type immunity and are involved in killing of pathogens. AAMϕ in vivo acquire functional characteristics to serve context-specific roles in homeostasis, inflammation, and fibrosis, with reports of both proinflammatory and immunoregulatory effects (20–23). AAMϕ are associated with Th2-biased immune responses such as those occurring in responses to helminths and allergens (20, 23–26), likely reflecting the polarizing effects of the microenvironment in which they develop (27, 28). The relative expression of molecules related to alternative activation of Mϕ may also be context dependent and not limited to Mϕ (25, 29, 30). Molecules linked to alternative activation of Mϕ (Resistin-like molecule-α [Relm-α], arginase-1 [Arg-1], and Ym1/Chitinase3-like3) are found in the lungs of OVA-sensitized and challenged mice (20, 25, 31, 32). Related molecules (Chitinase1, Chitinase3-like1, and Stabilin1) are found in humans with asthma and chronic obstructive pulmonary disease (COPD) (33–35). However, the function of Mϕ, especially in a complex disease like asthma, is still controversial (26, 36). We recently showed, using a model of allergic pulmonary inflammation induced by an extract (Dermatophagoides farinae) from the house dust mite D. farinae (37), that although dendritic cells (DCs) require the functions of gV-sPLA2 for effective Ag uptake and Th2-priming ability, gV-sPLA2 in other cell type(s) is required for the development of D. farinae–induced pulmonary pathology. Because gV-sPLA2 is critical for certain Mϕ functions (38, 39), and Mϕ have been associated with Ag-induced Th2 responses, we hypothesized that endogenous expression of gV-sPLA2 by Mϕ might contribute to the induction of D. farinae–mediated pulmonary inflammation. Indeed, we demonstrate in this study that gV-sPLA2 expression by Mϕ can facilitate allergic pulmonary inflammation in D. farinae–sensitized Pla2g5-null recipients or in IL-4–treated Pla2g5-null mice. gV-sPLA2 expression is induced during both human and mouse IL-4–mediated activation of Mϕ in vitro, and its absence impairs Mϕ activation in vivo, independently of effects on the adaptive immune response. 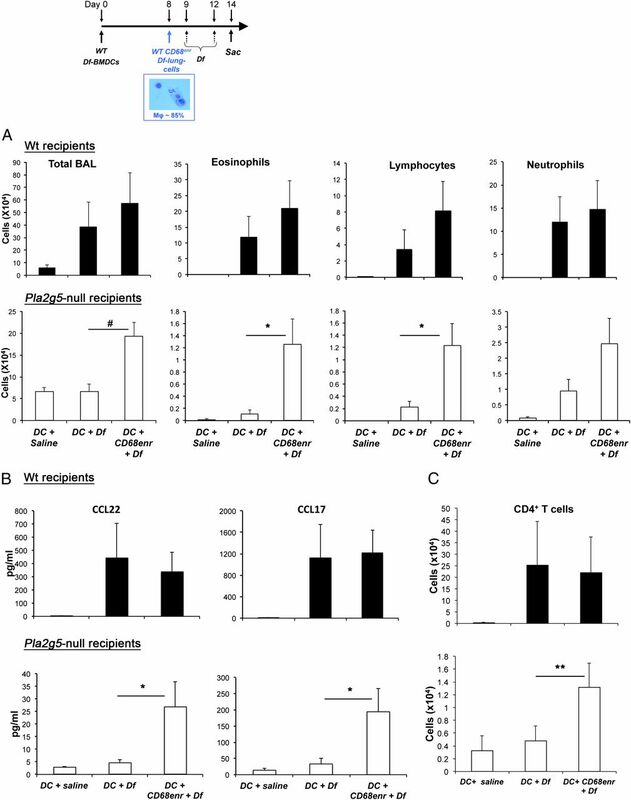 Moreover, whereas gV-sPLA2–expressing DCs can initiate Th2 responses in the lymph nodes of Pla2g5-null recipients (37), gV-sPLA2–expressing Mϕ are sufficient to induce the generation of CCL22 and CCL17, pulmonary T cell recruitment, and eosinophilic inflammation in response to D. farinae. gV-sPLA2 is thus a novel cross-species mediator of Mϕ activation and regulator of Mϕ effector functions and may prove to be a fruitful therapeutic target in asthma. C57BL/6 wild-type (WT) and Pla2g5-null mice (40) (9–12-wk-old males) received 3 μg D. farinae extract (Greer Laboratories, Lenoir, NC) in 20 μl NaCl 0.9% (containing <0.005 endotoxin/ml; Sigma-Aldrich, St. Louis, MO) or saline alone intranasally on days 0, 4, 7, 11, 14, and 18 (37). For IL-4–induced pulmonary inflammation, WT and Pla2g5-null naive mice were given mouse rIL-4 (1 or 5 μg/dose; PeproTech, Rocky Hill, NJ) intratracheally (i.t.) on days 1, 2, and 5, and mice were euthanized 36 h after the last dose (41). For blocking experiments, mouse CCL22 and CCL17 polyclonal neutralizing Abs (R&D Systems, Minneapolis, MN) were administered i.p. (20 μg/dose in 500 μl NaCl 0.9%) 30 min before the last four doses of D. farinae. Bronchoalveolar lavage (BAL) was performed with 0.7 ml PBS (Sigma-Aldrich) containing 0.5 mM EDTA (three times). The BAL fluid was collected, and the cell pellet was counted, cytospun, and stained with Diff-Quick (Fisher Diagnostic, Middletown, VA) (37). ELISAs were used to measure CCL22 and CCL17 (R&D Systems), as well as IL-5 and IL-13 (eBioscience) in cell-free BAL fluid. All animal experiments were approved by the Animal Care and Use Committee of the Dana-Farber Cancer Institute (Boston, MA). For immunohistochemical and immunofluorescence analysis, left lungs were collected from each mouse after BAL and fixed with 4% paraformaldehyde for at least 8 h. The lungs were washed twice with washing buffer (PBS containing 2% DMSO) and suspended in 50 mM NH4Cl overnight at 4°C. Then the lungs were embedded in paraffin or glycolmethacrylate. Lung sections were deparaffinized and rehydrated, and Ag retrieval was performed with Target Retrieval Solution (DakoCytomation, Glostrup, Denmark) at 37°C for 30 min. After blocking with 10% chicken serum, samples were stained (1 h) with rabbit anti-mouse Relm-α (PeproTech) and then washed and incubated (1 h) with Alexa Fluor-594 chicken anti-rabbit IgG and Hoechst nuclear staining (Invitrogen, Carlsbad, CA). The sections were washed mounted and imaged with an Eclipse 80i microscope (Nikon Instruments, Melville, NY) (37). After removing airway cells and alveolar Mϕ by extensive BAL with PBS/0.5 mM EDTA, lungs were homogenized through a 70-μm mesh in ice-cold complete medium (37) (RPMI 1640, 10% FBS, 100 U/ml penicillin, 100 μg/ml streptomycin, 0.1 mM nonessential amino acids, 2 mM l-glutamine, and 0.05 μM 2-ME). The homogenate was then washed and incubated (30 min, 37°C) with 428 U/ml Collagenase IV (Worthington, Lakewood, NJ) and 20 μg/ml DNAse I (Roche, Mannheim, Germany). The obtained cell suspension from pooled mice was washed and layered onto a Percoll gradient (Sigma-Aldrich) (60 and 40%). After centrifugation at 600 × g for 20 min at 37°C, the cells at each interface were collected, washed, and centrifuged again onto a second density gradient. At the end of the procedure, the obtained cells represented an enriched (70–80%) population of lung Mϕ (CD68enr) as determined by flow cytometry. Total RNA was isolated from the cell lysate with TRIreagent (Sigma-Aldrich), reverse transcribed into cDNA (High-Capacity cDNA Reverse Transcription Kit; Applied Biosystems), and measured by real-time quantitative PCR (qPCR) with the use of SYBR Green/ROX master mix (SABiosciences, Frederick, MD) on an Mx3005P thermal cycler (Stratagene, Santa Clara, CA) (37). The ratio of each mRNA relative to the GAPDH mRNA was calculated with the ΔΔ threshold cycle method. The primers are described in Table I.
WT and Pla2g5-null or C57BL/6 and IL-2Rγ–null bone marrow (BM) cells were collected from femurs and tibiae of mice. The disaggregated cells were counted and suspended in complete medium containing 50 ng/ml murine rM-CSF (PeproTech) at a concentration of 4.0 × 106 cells/ml in a 10 ml/Petri dish. On day 3, 10 ml medium containing rM-CSF was added. On day 7, the cells were pulsed with 20 ng/ml IL-4 (PeproTech) for BM–IL-4–Mϕ (a surrogate of AAMϕ), LPS (100 ng/ml) (Sigma-Aldrich), and IFN-γ (200 U/ml) (PeproTech) for BM-LPS/IFN-γ–Mϕ (a surrogate of CaMϕ) and cultured in medium (BM-Immature [IM]–Mϕ) or IL-4 and/or IL-13, IL-33, and GM-CSF (PeproTech). After 24 h, cells were harvested with PBS containing Lidocaine (4 mg/ml) and EDTA (5 mM) (15 min, 37°C) (39) and analyzed by flow cytometry. For adoptive transfer, 1 × 105 WT and Pla2g5-null BM-IM–Mϕ were transferred i.t. into naive WT and Pla2g5-null mice at day 0, followed by 5 μg/dose IL-4 i.t. on days 1, 2, and 5. Leukocyte-enriched buffy coat from healthy donors was overlaid on Ficoll-Paque Plus (GE Healthcare, Buckinghamshire, U.K.) and centrifuged at 600 × g for 20 min. The mononuclear layer at the interface was collected, washed, and counted. Monocytes were isolated by negative selection (Miltenyi Biotec, Auburn, CA) and plated at 1–1.5 × 106 cells/ml in 30-mm Petri dishes. The cells were cultured for 7 d in complete medium supplemented with human rM-CSF (50 ng/ml; R&D Systems, Minneapolis, MN). To activate monocyte-derived Mϕ (42), cells were polarized for 24 h in complete medium, without M-CSF, supplemented with IL-4 (R&D Systems) (20 ng/ml) (human [h]IL-4–Mϕ) as a surrogate of human AAMϕ or LPS (Sigma Aldrich) (100 ng/ml) and IFN-γ (R&D Systems) (20 ng/ml) (hLPS/IFN-γ–Mϕ) as a surrogate of human CaMϕ. To knock down gV sPLA2, after culturing the monocytes for 7 d in M-CSF, the cells were harvested by incubation with Lidocaine/EDTA, washed, and counted. Mϕ were transfected with human Pla2g5 ON-TARGET Plus siRNA or nontargeting vector control (Dharmacon; 100 and 1000 nM) using the Amaxa Human Macrophage Nucleofector kit (Amaxa, Lonza, Germany), according to the manufacturer’s instructions. After 24 h, the transfection medium was replaced by complete medium with or without IL-4 (20 ng/ml) for polarization. Twenty-four hours later, the adherent cells were harvested by incubation with Lidocaine/EDTA and analyzed by qPCR and flow cytometry. qPCR was performed as described above. The primers are described in Table I. Lung cells were fixed with 4% paraformaldehyde (7 min, 21°C), washed, and permeabilized with 0.1% saponin (7 min, 21°C). After washing, cells were blocked (1 h, 4°C) with 1% rat anti mouse CD16/CD32 (BD Biosciences, San Jose, CA) and 10% donkey serum and then stained (1 h, 4°C) with appropriate Abs. Mouse cells were stained with Dectin1-FITC (clone 2A11), CD68-allophycocyanin (clone FA11), CD206-FITC (clone MR5D3) (AbD Serotec, Raleigh, NC), CD11c-PECy7 (clone N418), CD3-PECy7 (clone 145-2C11), B220-PerCP-Cy5.6 (clone RA3-6B2) (eBioscience, San Diego, CA), CD11b-FITC or –PE-Cy7 (clone M1/70), Ly6G-PE (clone 1A8), Ly6C-APC-Cy7 (clone HK1.4), SiglecF-PE (clone E50-2440), CD36-FITC (clone HM36), F4/80-allophycocyanin-Cy7 (clone BM8) (BioLegend, San Diego, CA), CD4-PECy7 (clone RM4-5; BD Biosciences), and corresponding isotypes as controls. Cells stained with rabbit Ab Relm-α (PeproTech) or rabbit IgG as control were washed and stained with Alexa 488 donkey anti-rabbit IgG (1:200; Jackson ImmunoResearch Laboratories, West Grove, PA). Human cells were stained with: CD11b-PE-Cy7 (clone ICRF44), CD209 (clone 9E9A8) (BioLegend), CD206-FITC (clone 19.2; BD Biosciences), CD36-FITC (clone SMϕ; AbD Serotec), and corresponding isotypes as controls. Acquisition was performed on an FACSCanto flow cytometer with FACSDiva software (BD Biosciences), and data were analyzed with FlowJo (Tree Star, Ashland, OR). Three-week-old recipient mice were lethally irradiated with two doses of 600 rad each (separated by 4 h). BM from donor mice was harvested from femora and tibiae, and 10 × 106 cells in 0.2 ml PBS was injected i.v. into recipient mice. BM transplantation was performed in four groups of mice: BM from Pla2g5-null into WT (expressing gV-sPLA2 on nonhematopoietic cells only); BM from WT into Pla2g5-null mice (expressing gV-sPLA2 on hematopoietic cells only); BM from Pla2g5-null to Pla2g5-null (expressing no gV-sPLA2); and BM from WT to WT. Mice in the latter two groups served as negative and positive controls for possible radiation effects. To permit complete chimerism, we allowed 10 wk of reconstitution time before we started experiments (43). At day 0, recipient mice were sensitized to D. farinae by transferring intranasally WT D. farinae–pulsed BM-derived DCs (Df-BMDCs) (5 × 104 i.t.) (37). At day 8, lung cells were harvested from D. farinae–challenged (3 μg/dose, six doses) WT donor mice. Lung cells were enriched over three Percoll gradients to have a population of >85% CD68+ Mϕ (Supplemental Fig. 3) and transferred (1 × 105) i.t. into sensitized WT and Pla2g5-null recipient mice. The recipient mice were challenged with D. farinae intranasally at day 9 and 12 and euthanized 36 h later (Fig. 6, inset). Lungs and lymph nodes were mechanically dispersed and filtered through a 70-μm cell strainer. Mononuclear cells were isolated on a NycoPrep density gradient (Axis-Shield) at 600 × g for 20 min. The mononuclear cells were washed and plated at 1 × 106 cells/ml in 24-well plates in RPMI containing 10% FBS, 100 U/ml penicillin, 100 μg/ml streptomycin, 0.1 mM nonessential amino acids, 2 mM l-glutamine, 0.043 mM 2-ME, 0.025 M HEPES buffer, and 1 mM sodium pyruvate. The cells were stimulated for 6 h at 37°C with PMA (50 ng/ml) and ionomycin (1 μM) to induce cytokine production. To stop exocytosis, we added monensin (2.5 μM) to the culture 4 h before collecting the cells. The cells were then treated with DNase I (60 μg/ml) for 15 min at 37°C. After washing, the cells were resuspended in fixation buffer (eBioscience) for 15 min and then washed and blocked in permeabilization buffer (eBioscience) containing 1% mouse IgG (Sigma-Aldrich) and 1% rat anti-mouse CD16/CD32 (BD Biosciences) for 20 min. Cells were stained for FACS analysis with anti-mouse CD4–PE-Cy7 (clone RM4-5), CD8α-allophycocyanin (clone 53-6.7), IL-4–PE (clone 11B11), IL-5–PE (clone TRFK5), IL-17A–PE (clone TC11-18H10) (BD Biosciences), IFN-γ–PE (clone XMG1.2) (eBioscience), or rat IgG1-PE isotype Ab (BD Biosciences) (44). The acquisition was performed on an FACSCanto flow cytometer (BD Biosciences), and data were analyzed with FlowJo (Tree Star). To compare dose-dependent induction of pulmonary inflammation by IL-4 in WT and Pla2g5-null mice, we performed two-way ANOVA with Tukey correction for multiple comparisons. To compare expression of gV-sPLA2 mRNA in in vitro–derived Mϕ (three groups), we used one-way ANOVA with Dunnett’s correction for multiple comparisons. Both comparisons were performed with Prism software (GraphPad, La Jolla, CA). Comparisons between two groups were made using an unpaired Student t test. Data are expressed as mean ± SEM, and p < 0.05 was considered significant. Our previous study showed that gV-sPLA2 was expressed in the epithelium and in cells infiltrating the lung of D. farinae–treated mice, including cells with the morphology of Mϕ (37). To start to investigate whether gV-sPLA2 is involved in the activation and functions of Mϕ generated during D. farinae–induced pulmonary inflammation, we analyzed the expression of Relm-α by immunofluorescence. The lungs of D. farinae–treated WT mice showed strong staining for Relm-α on epithelial cells (Fig. 1Aii, thick arrow) and on infiltrating cells with the morphologies typical of Mϕ and eosinophils (Fig. 1Bi, large and small arrowhead, respectively). In contrast, Relm-α staining was not observed on cells infiltrating the lungs of D. farinae–treated Pla2g5-null mice (Fig. 1Bii), but did localize to the epithelium with a distribution and intensity similar to the WT controls (Fig. 1Aiv, thin arrow). Neither genotype showed Relm-α staining in the lungs of saline-treated mice (Fig. 1Ai, Aiii). D. farinae–treated Pla2g5-null mice have reduced expression of molecules associated with alternative activation of Mϕ. (A and B) Sections from the lungs of WT and Pla2g5-null mice treated with saline (Ai, Aiii) or D. farinae (Aii, Aiv, Bi, Bii) were stained for Relm-α (red) and nuclei (blue). (A) Original magnification ×20. Scale bar, 50 μm. (B) High magnification of regions depicted in (A). Arrows point to Relm-α staining on epithelium of WT (large arrow) and Pla2g5-null (small arrow) mice. Large arrowhead points to a Mϕ; small arrowhead points to an eosinophil. (C) Forward (FSC) and side scatter (SSC) characteristics (left panel) and CD68 gating (right panel) of CD68enr/Df-lung-cells from WT and Pla2g5-null mice. (D) Net (isotype control subtracted) mean fluorescence intensity (MFI) of Dectin1 and Relm-α on gated CD68+ WT (filled bars) and Pla2g5-null (open bars) cells. (E) Expression of mRNA encoding AAMϕ (CCL22, Arg-1, MMP-12, CCL17, YM1, and CCL11) and CaMϕ (CXCL10 and iNOS) markers measured by qPCR. Data are expressed as ratio of the indicated mRNA expression relative to GAPDH. (A and B) Images are from one representative mouse per group from one of two experiments. (C) The lung cells are pooled from seven to nine mice per group, and representative plots are from one of six experiments. (D and E) Values are mean ± SEM of four to six independent experiments. *p < 0.05, #p < 0.02. To confirm that Mϕ from the lungs of D. farinae–treated Pla2g5-null mice lacked Relm-α and to determine whether they also differed in their expression of other molecules related to Mϕ activation, Mϕ were enriched from dispersed lung cells of D. farinae–treated WT and Pla2g5-null mice (D. farinae–induced lung cells enriched for CD68+ cells [CD68enr/Df-lung-cells]) and analyzed by flow cytometry. Forward and side scatter analysis showed three or two distinct populations, respectively, in WT and Pla2g5-null mice (Supplemental Fig. 1, respectively, top inset and bottom inset): both genotypes showed population (a), of which >90% were CD68+ and expressed CD11c (Supplemental Fig. 1A, 1D). In both genotypes, <10% of the CD68+ cells were in population (b) showing small forward and small side scatter (Supplemental Fig. 1B, 1E); of the CD68− cells <5% expressed CD3 or B220 (data not shown). Only WT mice showed population (c) with homogeneous forward scatter and high side scatter, characteristic of granulocytes (Supplemental Fig. 1C). Similar numbers of CD68+ cells were recovered from the lungs of D. farinae–challenged WT and Pla2g5-null mice (respectively, 1.52 ± 0.04 and 1.02 ± 0.06 × 105 from four experiments, data not shown) expressing similar levels of CD11c (67.78 ± 6.8% and 66.29 ± 0.41%, respectively) (data not shown). The CD68+ cells of D. farinae–treated WT mice expressed significantly more Relm-α protein than CD68+ cells of D. farinae–treated Pla2g5-null mice (Fig. 1D); Dectin1 also showed a similar but more modest trend. The expression of CD206 was similar in both genotypes (data not shown). The qPCR (Table I) of the CD68enr/Df-lung-cells from Pla2g5-null mice showed significantly lower expression of mRNAs encoding CCL22 and Arg-1 compared with CD68enr/Df-lung-cells from WT mice (Fig. 1E), with similar trends for matrix metalloproteinase-12 (MMP12), CCL17, Ym1, and CCL11. There were no differences in mRNA encoding inducible NO synthase (iNOS) and CXCL10 (Fig. 1E). Because gV-sPLA2 is expressed on epithelial cells and cells infiltrating the lungs of D. farinae–treated mice (37), we generated chimeric mice to determine whether gV-sPLA2 expression by hematopoietic cells or resident cells was more essential for development of D. farinae–induced pulmonary inflammation and/or the activation of Mϕ. Irradiated WT and Pla2g5-null mice were reciprocally transferred BM from both genotypes and after 10 wk exposed to D. farinae. WBC counts showed equivalent engraftment efficiencies among the groups (data not shown). D. farinae–treated WT mice receiving Pla2g5-null–BM did not develop BAL fluid eosinophilia (Fig. 2A). 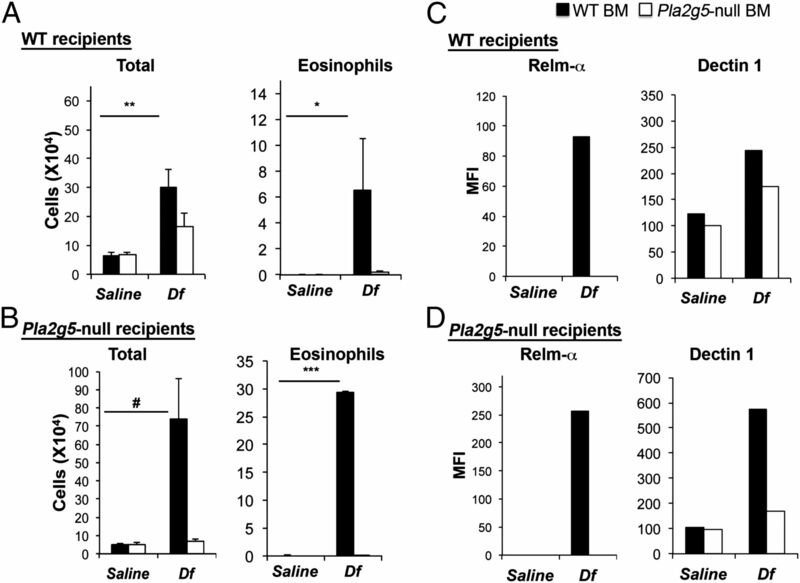 In contrast, D. farinae–treated Pla2g5-null mice engrafted with WT-BM developed pulmonary inflammation and BAL fluid eosinophilia to a level that exceeded that of the WT mice reconstituted with WT-BM (Fig. 2B). The Pla2g5-null mice engrafted with Pla2g5-null–BM did not develop inflammation in response to D. farinae (Fig. 2B). CD68enr/Df-lung-cells from engrafted mice that received WT-BM showed increased expression of Relm-α and Dectin1 following D. farinae treatment, independently of the genotype of the host (Fig. 2C, 2D). In marked contrast, CD68+ cells in mice receiving Pla2g5-null–BM lacked Relm-α and expressed less Dectin-1 than in mice receiving WT BM, regardless of host genotype. D. farinae–induced pulmonary inflammation in WT and Pla2g5-null chimeric mice depends on the presence of gV-sPLA2 in hematopoietic cells. Total and eosinophil cell counts from BAL fluid of WT (A) and Pla2g5-null mice (B) receiving WT (filled bars) or Pla2g5-null (open bars) BM cells. Net (isotype control subtracted) mean fluorescence intensity (MFI) of Dectin1 and Relm-α on gated CD68+ lung cells from pooled lungs of WT (C) and Pla2g5-null mice (D) receiving WT (filled bars) or Pla2g5-null (open bars) BM cells evaluated by flow cytometry. (A and B) Values are mean ± SEM of two independent experiments with 7–13 mice per group. (C and D) Results represent pooled cells from multiple mice in one of the two experiments, which showed similar results but different magnitude of responses. *p < 0.05, **p < 0.02, ***p < 0.01, #p < 0.03. In the absence of gV-sPLA2, D. farinae–treated mice showed deficient expression of Th2 cytokines in the lung (37). Because Mϕ are activated in Th2 environments, we sought to determine whether endogenously expressed gV-sPLA2 contributes to activation of Mϕ in vivo independently of the adaptive immune system (41). We instilled rIL-4 i.t. (1 and 5 μg/dose) to directly induce the effector pathways associated with a Th2 response without requirement of sensitization or T cell activation. In WT mice, both doses of IL-4 significantly increased the number of cells recruited into the airways, as well as eosinophils (5 μg/dose) and mononuclear cells (1 μg/dose). These responses were significantly diminished in the Pla2g5-null mice (Fig. 3A). The numbers of neutrophils and Mϕ were similar in the two genotypes. To verify the effect of IL-4 activation on Mϕ in vivo, we analyzed the expression of Relm-α and Dectin1 in WT and Pla2g5-null lung CD68+ cells. IL-4 at 5 μg induced the expression of Relm-α by WT CD68+ cells (Fig. 3B), but not by Pla2g5-null CD68+ cells. WT and Pla2g5-null CD68+ cells from saline- and IL-4–treated (1 μg) mice did not express Relm-α, whereas the expression of Dectin1 was similar in IL-4–treated WT and Pla2g5-null CD68+ cells (data not shown). Both genotypes showed minimal induction and similar amounts of IL-5 and IL-13 in the BAL after IL-4 treatment (data not shown). 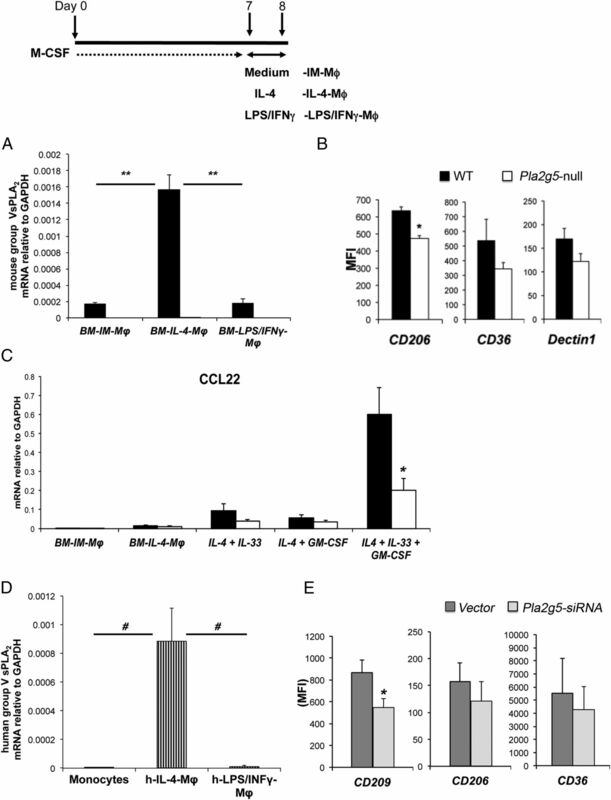 IL-4–induced pulmonary inflammation requires gV-sPLA2. (A) Total and differential cell counts from BAL fluid of WT (filled bars) and Pla2g5-null (open bars) mice exposed to IL-4 1 or 5 μg/dose i.t. (B) Net (isotype control subtracted) mean fluorescence intensity (MFI) of Relm-α on gated CD68+ lung cells of WT (filled bars) and Pla2g5-null (open bars) mice exposed to IL-4 5 μg/dose i.t. and evaluated by flow cytometry. (A) Values are mean ± SEM from two independent experiments with 10–17 mice per group. (B) Data are representative of pooled cells from multiple mice in one of the two experiments with seven to nine mice per group. *p < 0.05, **p < 0.01, ***p < 0.001, ****p < 0.0001, #p < 0.02. Next we asked whether the in vivo phenotype of D. farinae–induced Mϕ could be replicated in vitro. WT and Pla2g5-null BM-Mϕ cultured with rM-CSF (BM-IM–Mϕ), were polarized with IL-4 (BM–IL-4–Mϕ, a surrogate of AAMϕ) or LPS and IFN-γ (BM-LPS/IFN-γ–Mϕ, a surrogate of CaMϕ) (Fig. 4, inset). As determined by qPCR, gV-sPLA2 mRNA was virtually undetectable in WT BM-IM–Mϕ and WT BM-LPS/IFN-γ–Mϕ, but was sharply upregulated in WT BM–IL-4–Mϕ (Fig. 4A). To determine whether the lack of gV-sPLA2 in in vitro–derived Mϕ altered the ability of IL-4 to induce the expression of markers of alternative activation (18, 19), we analyzed WT and Pla2g5-null BM–IL-4–Mϕ by flow cytometry. The expression of CD206 was significantly higher on WT than on Pla2g5-null BM–IL-4–Mϕ, with similar trends for CD36 and Dectin1 (Fig. 4B). Relm-α expression was weak and inconsistently detected in BM–IL-4–Mϕ, whereas other markers showed similar expression (data not shown). Stimulation of WT BM-IM–Mϕ with IL-13 induced gV-sPLA2 expression, but less potently than IL-4 (Supplemental Fig. 2A). The induction of gV-sPLA2 expression by IL-4 was absent in BM-IM–Mϕ lacking the common γ-chain of the IL-2R (IL-2Rγ–null mice) (Supplemental Fig. 2B, left panel). The expression of CD206 was also significantly less inducible in the IL-2Rγ–null BM–IL-4–Mϕ than in the WT control cells (Supplemental Fig. 2B, right panel). Expression of the Mϕ-associated chemokines CCL17 and CCL22 mRNA was not induced by IL-4 alone in either genotype. However, the addition of IL-33 (20), in combination with GM-CSF (45) during the IL-4–induced polarization step, resulted in robust induction of CCL22 mRNA expression. This induction was substantially blunted in the Pla2g5-null BM–IL-4–Mϕ treated with GM-CSF and IL-33 (Fig. 4C). IL-4/IL-33/GM-CSF did not increase the expression of other markers of alterative activation (including CCL17), nor did it further increase the expression of gV-sPLA2 mRNA compared with IL-4 alone (data not shown). Polarization of Mϕ toward alternative activation requires gV-sPLA2 in mouse and human. (A) Expression of gV-sPLA2 mRNA relative to GAPDH measured by qPCR in WT (filled bars) and Pla2g5-null (open bars) mouse BM-IM–Mϕ or BM-IM–Mϕ polarized with IL-4 or LPS/IFN-γ (BM-IL-4-Mϕ and BM-LPS/IFNγ-Mϕ, respectively). (B) Net (isotype control subtracted) mean fluorescence intensity (MFI) of CD206, CD36, and Dectin1 on CD11b+/F480+ WT (filled bars) and Pla2g5-null (open bars) mouse BM–IL-4–Mϕ evaluated by flow cytometry. (C) Expression of CCL22 relative to GAPDH in BM-IM–Mϕ, BM-IM–Mϕ polarized with IL-4, IL-4 + IL-33, IL-4 + GM-CSF, and IL-4 + IL-33 + GM-CSF measured by qPCR. (D) Expression of human gV-sPLA2 mRNA relative to GAPDH in monocytes, IL-4, and LPS/IFN-γ–polarized human monocyte-derived Mϕ (hIL-4–Mϕ and hLPS/IFN-γ–Mϕ, respectively) measured by qPCR. (E) Transfection of hIL-4–Mϕ with human Pla2g5–small interfering RNA (siRNA) (light gray columns) or nontargeting vector (dark gray columns) (1000 nM) and net (isotype control subtracted) MFI of CD209, CD206, and CD36 on gated CD11b+ cells evaluated by flow cytometry. Values are mean ± SEM of three (A, C–E) or four to six (B) independent experiments. *p < 0.05, **p < 0.001, #p < 0.002. To determine whether the expression of gV-sPLA2 was induced by IL-4-polarization of human monocyte-derived Mϕ, Mϕ were activated by IL-4 (hIL-4–Mϕ) or LPS/IFN-γ (hLPS/IFN-γ–Mϕ) and analyzed for the expression of gV-sPLA2 by qPCR. Freshly isolated monocytes and human monocyte-derived Mϕ lacked gV-sPLA2 mRNA (Fig. 4D and data not shown). However, gV-sPLA2 mRNA was significantly induced in hIL-4–Mϕ but not in hLPS/IFN-γ–Mϕ (Fig. 4C). IL-13 polarization of human monocyte-derived Mϕ modestly induced the expression of gV-sPLA2 (Supplemental Fig. 2C). Knockdown of gV-sPLA2 in hIL-4–Mϕ (Supplemental Fig. 2D) significantly reduced the expression of CD209 (or DC-specific ICAM-3–grabbing nonintegrin, a molecule associated with IL-4 activation of human Mϕ) (42) compared with vector-treated cells, whereas the effects on CD206 and CD36 were not significant (Fig. 4E). Next we wanted to determine whether in vivo gV-sPLA2 would permit the generation of mediators that could amplify pulmonary inflammation. Because Pla2g5-null CD68enr/Df-lung-cells had reduced mRNA expression for CCL22 and CCL17 (Fig. 1E), two Th2-active chemokines that can be produced by Mϕ in vivo (19), and because this phenotype could be partially replicated in vitro (Fig. 4C), we measured CCL22 and CCL17 levels in the BAL fluid of WT and Pla2g5-null mice after six challenges with D. farinae. The levels of CCL22 and CCL17 were significantly higher in the BAL fluid of D. farinae–treated WT mice compared with D. farinae–treated Pla2g5-null mice (Fig. 5A). Because these chemokines recruit Th2 cells (46, 47), we quantified the number and type of T cells present in the lungs of WT and Pla2g5-null mice treated with D. farinae. The WT but not the Pla2g5-null mice showed a significant increase in the number of T cells recruited into the lung in response to D. farinae (Fig. 5B). Compared to WT mice, Pla2g5-null mice had significant reductions in lung T cells producing IL-4, IL-5, IL-17, and IFN-γ. T cells from parabronchial lymph nodes showed a similar trend, possibly reflecting the absence of gV-sPLA2 in DC (data not shown). To ascertain the contributions of CCL22 and CCL17 to the pathologic features of the D. farinae model of pulmonary inflammation, we administered blocking Ab against CCL22 or CCL17 to WT and Pla2g5-null mice 30 min before each of the last four doses of D. farinae. Administration of CCL22 Ab to D. farinae–treated WT mice reduced the total numbers of cells and lymphocytes in the BAL fluid to levels comparable to those observed in D. farinae–treated Pla2g5-null mice (Fig. 5C). The blocking of CCL17 did not reduce BAL cellularity (Fig. 5D). gV-sPLA2 is required for generation of CCL22 and CCL17 in the lung. (A) Levels of CCL22 and CCL17 measured by respective ELISAs in BAL fluid of WT (filled bars) and Pla2g5-null (open bars) mice treated with saline or D. farinae. (B) Lung CD4+ cell counts and intracellular cytokine expression evaluated by flow cytometry. Total cell and differential counts from BAL fluid of WT and Pla2g5-null mice treated with saline, D. farinae (Df), D. farinae + isotype control, or D. farinae + CCL22 Ab (C) or saline, D. farinae (Df), D. farinae + isotype control, or D. farinae + CCL17 Ab (D). Values are mean ± SEM from three independent experiments with 8–17 mice per group (A, B) or from two independent experiments with 5–9 mice per group (C, D). *p < 0.05, **p < 0.03, #p < 0.01. Because Mϕ activated in vitro by IL-4 (Fig. 4) only partially replicated the phenotype of Mϕ developed in vivo after D. farinae exposure (Fig. 1), we adoptively transferred lung Mϕ derived in vivo to verify that the presence of gV-sPLA2 in Mϕ was important to amplify inflammation in sensitized mice. We sensitized WT and Pla2g5-null mice to D. farinae using WT Df-BMDCs (containing <1% eosinophils, data not shown), which are sufficient in both recipient strains to elicit an Ag-specific recall response in regional lymph nodes (37). Then, we transferred WT CD68enr/Df-lung-cells into the sensitized mice (Fig. 6, inset). The CD68enr/Df-lung-cells were enriched to >85% CD68+ cells using three consecutive gradients before the transfer (Supplemental Fig. 3). Less than 5% of the CD68− cells expressed CD3 or B220 (data not shown). 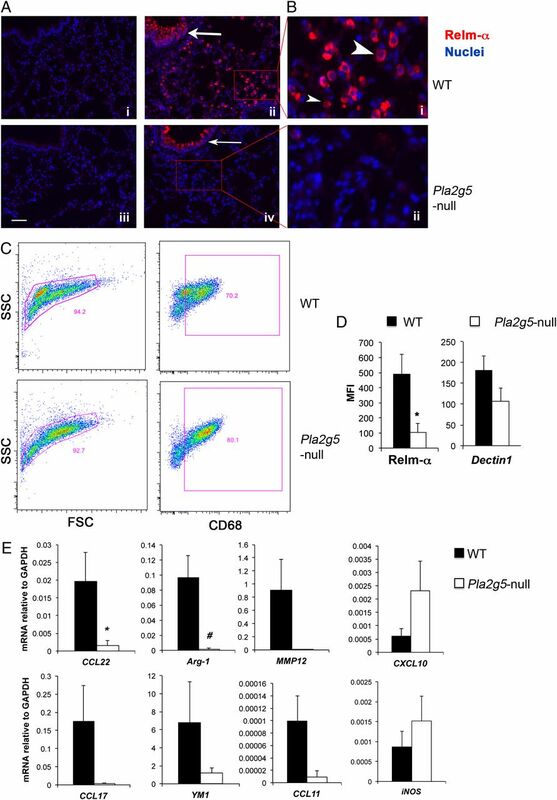 Control Pla2g5-null mice not receiving WT CD68enr/Df-lung-cells failed to increase cell numbers or eosinophils in the BAL fluid after D. farinae challenge, whereas identically treated WT control mice did (Fig. 6A, bottom center panels). The transfer of WT CD68enr/Df-lung-cells into DC-sensitized Pla2g5-null mice significantly increased the total cell number, eosinophils, and lymphocytes in the BAL fluid (Fig. 6A, bottom left panel), albeit with lower values compared with control WT mice. The transfer WT CD68enr/Df-lung-cells into WT mice did not significantly increase the recruitment of eosinophils, lymphocytes or total BAL fluid cells (Fig. 6A, top panel). Transfer of CD68enr/Df-lung-cells into DC-sensitized WT or Pla2g5-null recipient mice amplifies D. farinae–induced pulmonary inflammation through chemokine-induced T cell recruitment. (A) Total cell and differential cell counts from BAL fluid of WT and Pla2g5-null recipient mice that were sensitized at day 0 with WT Df-BMDCs. At day 8, CD68enr/Df-lung-cells were transferred i.t. At days 9 and 12, mice were challenged with D. farinae or saline intranasally (DC + Saline, DC + D. farinae [Df], or DC + CD68enr/Df-lung-cells + D. farinae). Inset, Mice were euthanized 36 h after the last dose. Cells were stained with Diff-Quick; original magnification ×60. (B) ELISA measurement of CCL22 and CCL17 released in BAL fluid. (C) Lung CD4+ cell counts evaluated by flow cytometry. Values are mean ± SEM of three independent experiments with 10–23 mice per group. *p < 0.05, **p < 0.03, #p < 0.001. To confirm that the amplification of the effector phase of pulmonary inflammation by WT CD68enr/Df-lung-cells was associated with increased generation of CCL22 and CCL17, we measured these chemokines in the BAL fluid of transferred mice. There was a significant increase in the amount of CCL22 and CCL17 produced by Pla2g5-null mice transferred with WT Df-BMDCs and WT CD68enr/Df-lung-cells compared with the Pla2g5-null mice transferred only with WT Df-BMDCs (Fig. 6B, bottom panel), although with values lower than control WT mice. To assess whether the transfer of gV-sPLA2–expressing WT CD68enr/Df-lung-cells into Pla2g5-null–sensitized mice increased the recruitment of CD4+ T cells into the lung, we measured the number of lung CD4+ T cells by flow cytometry. 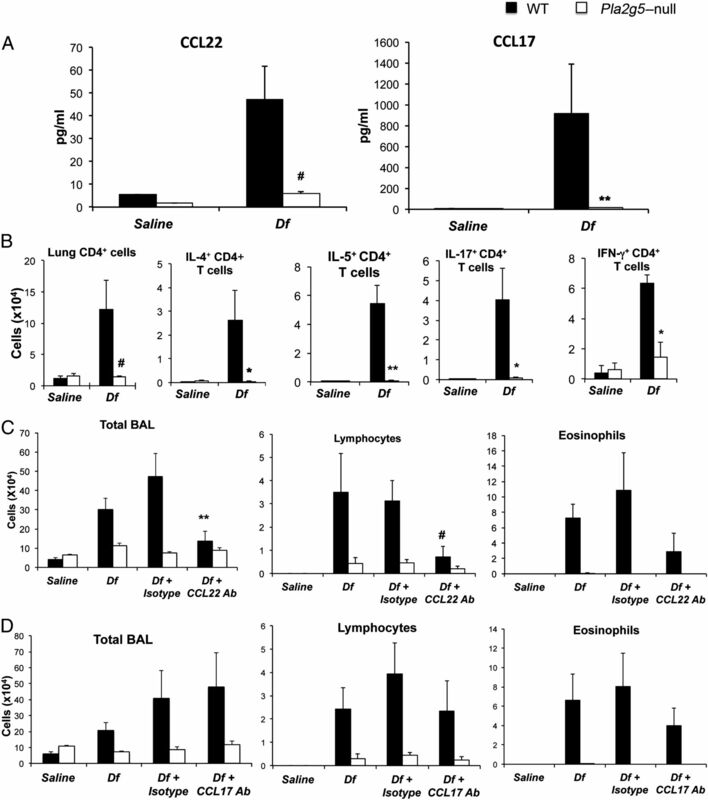 Pla2g5-null mice receiving Df-BMDCs and WT CD68enr/Df-lung-cells had significant more CD4+ T cells in the lung than Pla2g5-null mice receiving only Df-BMDCs (Fig. 6C, bottom panel). Because the CD68enr/Df-lung-cells contain non-Mϕ, which may also influence the effector phase of D. farinae–induced pulmonary inflammation, we used a second approach to verify that endogenous gV-sPLA2 in Mϕ is required for amplification of the effector phase of pulmonary inflammation. We cultured BM-IM–Mϕ from WT and Pla2g5-null BM and transferred them into WT and Pla2g5-null mice before exposing the mice to IL-4 to bypass the requirement for DC sensitization and to directly induce activation of the Mϕ in vivo. The BM-IM–Mϕ from WT and Pla2g5-null were 94.68 ± 2.82% and 92.48 ± 3.2% CD68+, respectively (Supplemental Fig. 4 and not depicted). The WT and Pla2g5-null CD68+ BM-IM–Mϕ expressed similar levels of CD11b (respectively, 95.48 ± 1.8 and 95.97 ±0.67%) and F4/80 (respectively, 48.21 ± 6.01 and 48.65 ± 3.84%; Supplemental Fig. 4 and not depicted). 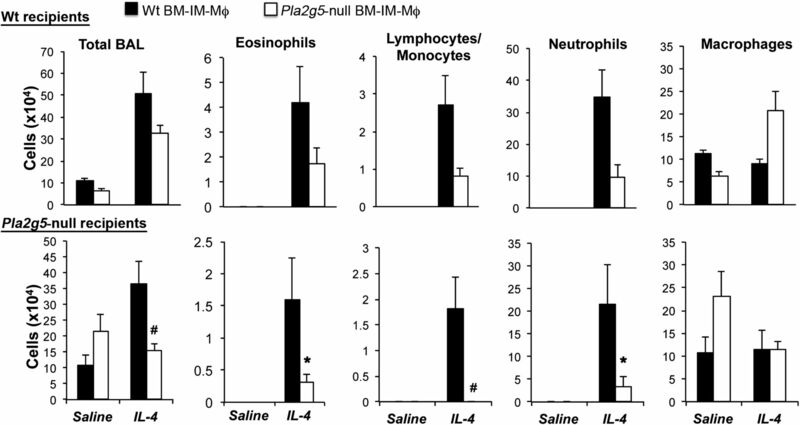 Transfers of WT BM-IM–Mϕ into Pla2g5-null mice significantly increased total number of cells in the BAL, and numbers of eosinophils, lymphocytes/monocytes, and neutrophils in response to IL-4 compared with transfers of Pla2g5-null BM-IM–Mϕ, with values similar to equally treated WT recipients (Fig. 7). WT BM-IM–Mϕ also tended to increase pulmonary inflammation in IL-4–treated WT mice, compared with WT mice transferred with Pla2g5-null BM-IM–Mϕ. Transfer of WT but not Pla2g5-null BM-IM–Mϕ into Pla2g5-null recipient mice amplifies IL-4–induced pulmonary inflammation. WT (top panel) and Pla2g5-null (bottom panel) recipient mice received WT (filled bars) and Pla2g5-null (open bars) BM-IM–Mϕ i.t. at day 0, followed by IL-4 (5 μg/dose) i.t. at days 1, 2, and 5. Mice were euthanized 36 h after the last dose. Values are mean ± SEM from one representative of two separate experiments with 5–10 mice per group. *p < 0.03, #p < 0.01. Several pathologic features of asthma, including eosinophilia, airway remodeling, and goblet cell metaplasia, are linked to the development and persistence of Th2-associated effector pathways. Using a model of allergic pulmonary inflammation induced by D. farinae, a complex allergen with endogenous adjuvant properties that commonly sensitizes individuals with asthma, we previously reported that gV-sPLA2 expression by DCs was necessary, but not sufficient, to cause the development of pulmonary Th2 responses (37). The current study establishes that although gV-sPLA2 is expressed by eosinophils and epithelial cells, its expression is induced in Mϕ during IL-4 activation and that the presence of gV-sPLA2 in Mϕ is sufficient to generate critical chemokines for the recruitment of effector T cells in this model. Indeed, Mϕ appear to be intermediaries between DC-dependent sensitization and the amplification of a D. farinae–directed effector response, with gV-sPLA2 being essential for both steps. Moreover, interference with the functions of gV-sPLA2 has the potential to interrupt this pathway for therapeutic purposes. Several sPLA2s (group V, IIA, and X) have been identified in the airways of patients with asthma (10, 11), and OVA models of pulmonary inflammation have established central roles for group V and group X sPLA2 (12, 13). However the cellular sources and the particular functions of each sPLA2 are largely unknown. gV-sPLA2 expression in the lungs of naive mice is weak or undetectable (37), but our previous studies showed that the enzyme localized prominently to Mϕ as well as eosinophils and epithelial cells following exposure to D. farinae (37). Because gV-sPLA2 is essential for normal function of Mϕ and for immune responses in a model of candidiasis (38, 39) in which Mϕ have the characteristics of AAMϕ (48, 49), and because allergen-induced pulmonary inflammation typically results in the expression of AAMϕ markers such as Relm-α (20, 25, 31, 32), we suspected that the absence of gV-sPLA2 might affect the phenotype of Mϕ and their function in the D. farinae model. We found that D. farinae–challenged mice lacking gV-sPLA2 showed induced expression of Relm-α in epithelial cells, but complete absence of this marker on cells infiltrating the lung, including Mϕ (Fig. 1A). We verified that WT and Pla2g5-null mice had similar total numbers of lung CD68+ Mϕ after D. farinae challenge, but that the CD68+ Mϕ from the lungs of D. farinae–treated Pla2g5-null mice showed very weak expression of molecules related to macrophage alternative activation at both the protein (Fig. 1D) and mRNA levels (Fig. 1E). These experiments suggested that the absence of gV-sPLA2 markedly impairs the activation of Mϕ in vivo. The expression of gV-sPLA2 in the lungs of D. farinae–challenged mice includes both resident (epithelium) and hematopoietic cells (Mϕ and eosinophils), all of which play a role in the pathophysiology of inflammation and Th2 responses. Several lines of evidence now indicate that the expression of gV-sPLA2 in Mϕ per se is required for the activation of Mϕ in our model. First, studies using chimeric mice we demonstrate that the expression of gV-sPLA2 by hematopoietic cells, but not by resident cells, contributes to the Th2-driven inflammatory response to D. farinae and to the activation of Mϕ in vivo (Fig. 2). Second, the activation of lung Mϕ (along with other features of allergic pulmonary inflammation) is markedly impaired in Pla2g5-null mice i.t. instilled with IL-4 (a model that induces Th2-like pathology independently of the adaptive immune system) (41) compared with WT controls (Fig. 3). Thus, although we cannot completely exclude contributions from gV-sPLA2 in cells other than Mϕ, the presence of the enzyme in hematopoietic cells contributes to activation of Mϕ by a pathway downstream of the adaptive immune response and the Th2-type cytokines IL-4 and IL-13. This is further validated by the impaired IL-4–IL-4Rγ-chain–mediated expression of gV-sPLA2 and other markers of macrophage activation (Supplemental Fig. 3B). Moreover, gV-sPLA2 expression is upregulated by IL-4 (and to a lesser extent by IL-13) in mouse and human Mϕ (Fig. 4A, 4D, Supplemental Fig. 3A, 3C), and the elimination or depletion of gV-sPLA2 from the Mϕ of both species selectively reduces the expression of some molecules related to macrophage activation (Fig. 4B, 4C, 4E). Collectively, these findings suggest that gV-sPLA2 contributes to the Th2-dependent pathway for activation of Mϕ and that this function is conserved across species. Mϕ are prominent in various models of Ag- or parasite-induced Th2-type pulmonary inflammation, although their specific function(s) are incompletely understood (22, 23, 26, 36, 50, 51). Because our previous studies suggested that D. farinae–driven pulmonary pathology required the function(s) of gV-sPLA2 in at least one cell type in addition to DCs (37), we focused on potential pathways and mechanisms by which gV-sPLA2–expressing Mϕ might amplify the response to D. farinae. A previous study revealed that lung myeloid cells were the most abundant source of the Th2-active chemokines CCL22 and CCL17 in a model of OVA-induced pulmonary disease using mice with an OVA-specific TCR (52). We found that the expression of both chemokines was profoundly decreased at the mRNA level in Pla2g5-null CD68enr/Df-lung-cells compared with WT controls (Fig. 1E), a phenotype that could be partially replicated in vitro (Fig. 4C), and that the levels of the corresponding proteins were significantly lower in the BAL fluid of D. farinae–treated Pla2g5-null mice as well (Fig. 5A). The importance of one of these chemokines (19), CCL22, was verified by Ab-mediated blockade, which markedly suppressed the accumulation of eosinophils and lymphocytes in the BAL fluid (Fig. 5C, 5D). The transfer of WT CD68enr/Df-lung-cells increased total cells, eosinophils, and lymphocytes in the BAL fluid of DC-sensitized Pla2g5-null mice (Fig. 6A) while also amplifying CCL22/CCL17 generation and the recruitment of CD4+ lung T cells (Fig. 6B, 6C). Finally, transfers of WT BM-IM–Mϕ, but not Pla2g5-null BM-IM–Mϕ, followed by i.t. 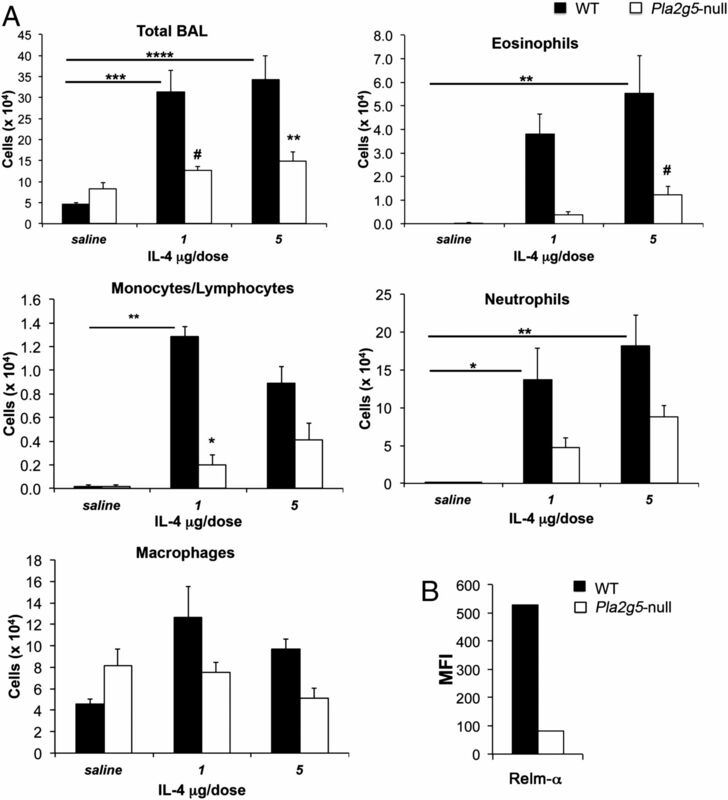 administration of IL-4 to directly induce the effector phase of pulmonary inflammation and in vivo activation of Mϕ, increased pulmonary inflammation in Pla2g5-null mice (Fig. 7). Although these findings do not preclude important functions of gV-sPLA2 in other cell types, they do suggest that gV-sPLA2–expressing Mϕ can amplify lung T cell recruitment and downstream eosinophilia (21) by generating T cell–attractive chemokines. Finer resolution of the roles of gV-sPLA2 in Mϕ versus other BM-derived cell types awaits the creation of mice with conditional deletion of the Pla2g5 allele. Our studies suggest a novel and unique role for gV-sPLA2 in regulating the activation and effector function of Mϕ in a model of pulmonary inflammation caused by D. farinae, a clinically relevant allergen. Our data support a role of Mϕ in amplification of pulmonary inflammation through T cell recruitment and production of Th2-attractive chemokine (CCL22 and CCL17), molecules increased in the lung and/or serum of patients with severe asthma and COPD (20, 32–34, 53). Because gV-sPLA2 is induced by IL-4 in both mouse and human Mϕ and is sufficient for the effector functions of Mϕ in pulmonary inflammation, our study suggests potential therapeutic implications of targeting this enzyme in severe asthma, COPD, or other diseases in which Th2-activated Mϕ may play an effector role. We thank Jennifer Zacharia for excellent technical support. This work was supported by National Institutes of Health Grants AI064226 and HL113071 (to B.B. ), AI52353, AI31599, AI07306, and HL36110 (to J.A.B. ), and a generous contribution from the Vinik family. B.B. is also supported by an American Lung Association/American Academy of Allergy, Asthma & Immunology Allergic Respiratory Diseases Award.
. 2009. Phospholipase A2 structure/function, mechanism, and signaling. J. Lipid Res. 50(Suppl): S237–S242.
. 2011. Leukotrienes and airway inflammation. Biochim. Biophys. Acta 1810: 1096–1102. 2008. Eicosanoids in asthma, allergic inflammation, and host defense. Curr. Mol. Med. 8: 335–349.
. 2000. Cytosolic phospholipase A2 is required for macrophage arachidonic acid release by agonists that Do and Do not mobilize calcium. Novel role of mitogen-activated protein kinase pathways in cytosolic phospholipase A2 regulation. J. Biol. Chem. 275: 20146–20156.
. 2008. Biochemistry and physiology of mammalian secreted phospholipases A2. Annu. Rev. Biochem. 77: 495–520.
. 2006. Group V sPLA2: classical and novel functions. Biochim. Biophys. Acta 1761: 1280–1288.
. 2011. Secreted phospholipase A2 revisited. J. Biochem. 150: 233–255.
. 2012. Phospholipases: an overview. Methods Mol. Biol. 861: 63–85.
. 1996. Antigen-induced generation of lyso-phospholipids in human airways. J. Exp. Med. 183: 2235–2245.
. 2000. Cell-specific expression of group X and group V secretory phospholipases A(2) in human lung airway epithelial cells. Am. J. Respir. Cell Mol. Biol. 23: 37–44.
. 2011. Relationship between levels of secreted phospholipase A(2) groups IIA and X in the airways and asthma severity. Clin. Exp. Allergy. 41: 801–810.
. 2007. Deletion of secretory group V phospholipase A2 attenuates cell migration and airway hyperresponsiveness in immunosensitized mice. J. Immunol. 179: 4800–4807.
. 2007. Importance of group X-secreted phospholipase A2 in allergen-induced airway inflammation and remodeling in a mouse asthma model. J. Exp. Med. 204: 865–877.
. 2009. Orchestration of macrophage polarization. Blood 114: 3135–3136.
. 2009. IL-33 amplifies the polarization of alternatively activated macrophages that contribute to airway inflammation. J. Immunol. 183: 6469–6477.
. 2007. Alternative activation is an innate response to injury that requires CD4+ T cells to be sustained during chronic infection. J. Immunol. 179: 3926–3936.
. 2009. Bone marrow cell derived arginase I is the major source of allergen-induced lung arginase but is not required for airway hyperresponsiveness, remodeling and lung inflammatory responses in mice. BMC Immunol. 10: 33.
. 2000. FIZZ1, a novel cysteine-rich secreted protein associated with pulmonary inflammation, defines a new gene family. EMBO J. 19: 4046–4055.
. 2012. Allergic airway disease is unaffected by the absence of IL-4Ralpha-dependent alternatively activated macrophages. J. Allergy Clin. Immunol. 130: 743–750.e748.
. 2002. IL-4 dependent alternatively-activated macrophages have a distinctive in vivo gene expression phenotype. BMC Immunol. 3: 7.
. 2012. Macrophage plasticity and polarization: in vivo veritas. J. Clin. Invest. 122: 787–795.
. 2008. Persistent activation of an innate immune response translates respiratory viral infection into chronic lung disease. Nat. Med. 14: 633–640.
. 2009. New asthma biomarkers: lessons from murine models of acute and chronic asthma. Am. J. Physiol. Lung Cell. Mol. Physiol. 296: L185–L197.
. 2003. Dissection of experimental asthma with DNA microarray analysis identifies arginase in asthma pathogenesis. J. Clin. Invest. 111: 1863–1874.
. 2009. Macrophage chitinase 1 stratifies chronic obstructive lung disease. Am. J. Respir. Cell Mol. Biol. 41: 379–384.
. 2007. A chitinase-like protein in the lung and circulation of patients with severe asthma. N. Engl. J. Med. 357: 2016–2027.
. 2011. More alternative activation of macrophages in lungs of asthmatic patients. J. Allergy Clin. Immunol. 127: 831–833.
. 2012. Resistin-like molecule-α regulates IL-13-induced chemokine production but not allergen-induced airway responses. Am. J. Respir. Cell Mol. Biol. 46: 703–713.
. 2010. Group V secretory phospholipase A2 reveals its role in house dust mite-induced allergic pulmonary inflammation by regulation of dendritic cell function. J. Immunol. 185: 4430–4438.
. 2006. Group V secretory phospholipase A2 translocates to the phagosome after zymosan stimulation of mouse peritoneal macrophages and regulates phagocytosis. J. Biol. Chem. 281: 6691–6698.
. 2009. Group V secretory phospholipase A2 modulates phagosome maturation and regulates the innate immune response against Candida albicans. J. Immunol. 182: 4891–4898.
. 2004. Role of group V phospholipase A2 in zymosan-induced eicosanoid generation and vascular permeability revealed by targeted gene disruption. J. Biol. Chem. 279: 16488–16494.
. 1998. Requirement for IL-13 independently of IL-4 in experimental asthma. Science 282: 2261–2263.
. 2010. Fas-activated serine/threonine phosphoprotein promotes immune-mediated pulmonary inflammation. J. Immunol. 184: 5325–5332.
. 2005. Chemokines and their receptors in the pathogenesis of allergic asthma: progress and perspective. Curr. Opin. Pulm. Med. 11: 35–42.
. 2008. T cell trafficking in allergic asthma: the ins and outs. Annu. Rev. Immunol. 26: 205–232.
. 2003. Dectin-1 expression and function are enhanced on alternatively activated and GM-CSF-treated macrophages and are negatively regulated by IL-10, dexamethasone, and lipopolysaccharide. J. Immunol. 171: 4569–4573.
. 2010. PPARgamma controls dectin-1 expression required for host antifungal defense against Candida albicans. PLoS Pathog. 6: e1000714.
. 2009. Alternatively activated macrophage-derived RELM-alpha is a negative regulator of type 2 inflammation in the lung. J. Exp. Med. 206: 937–952.
. 2012. Trefoil factor 2 rapidly induces interleukin 33 to promote type 2 immunity during allergic asthma and hookworm infection. J. Exp. Med. 209: 607–622.
. 2009. CD11b+ myeloid cells are the key mediators of Th2 cell homing into the airway in allergic inflammation. J. Immunol. 182: 623–635.
. 2004. CCR4 ligands are up-regulated in the airways of atopic asthmatics after segmental allergen challenge. Eur. Respir. J. 23: 876–884.